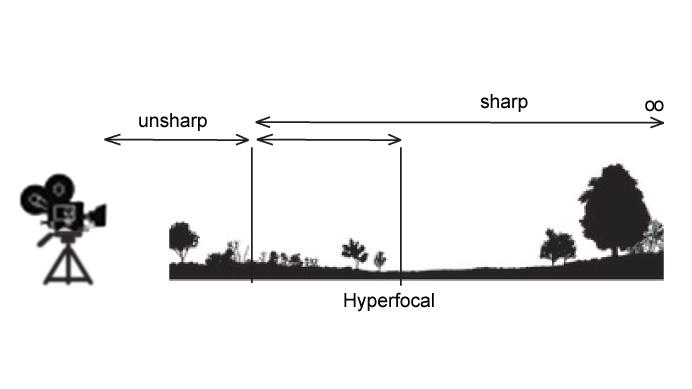 Hyperfocal Distance in film making states that what ever hyperfocal distance the camera lens is set to, objects that are half that distance (nearer to camera) and off into infinity will appear in acceptable focus. Using a calculation of hyperfocal distance is a way to know what objects that are placed in the foreground of your scene will remain in focus compared to other objects at other distances from the camera set-up. Hyperfocal Distance in film making states that what ever hyperfocal distance the camera lens is set to, objects that are half that distance (nearer to camera) and off into infinity will appear in acceptable focus. Using a calculation of hyperfocal distance is a way to know what objects that are placed in the foreground of your scene will remain in focus compared to other objects at other distances from the camera set-up.